The Wake-up Call – Falling off track! Staying Active and eating healthy is not easy! It requires a change with many things such as sleeping! If you want to exercise in the morning, you’ve got to wake up earlier or change something within your current habit to support 30 – 60 minutes or more of exercise! You’ve got to determine how many times per week and stick with it, believe me it’s hard as I have had plenty of days where I didn’t want to do anything where I felt tired or too stressed. However, the minute I did, afterwards I felt great, but again it’s hard. Also you’ve got to consider eating differently, don’t have cookies or donuts in the morning or throughout the day – especially if your co-workers bring in such food. Go for the carrots, not the cookies – again easier said than done as I’ll admit my diet could and should change. I get plenty of exercise but I can’t say I eat the best as I typically have a snack every morning. You just don’t know what that is doing to your body unless you take those steps to find out as my next guest can speak towards. I met Suzanne by way of social media – gotta love these tools, what did we do before, pick up the phone? ‘I did not follow any particular diet, just focused on portion sizes and ingredients. After I began to lose weight, I felt more comfortable getting outdoors and using my home treadmill to start a cardio routine. I have lost over 50 pounds and my blood work is textbook perfect! I have reversed my liver damage completely and my cholesterol is very low. My blood pressure is better than average! I see people who knew me a few years ago and they do not recognize me. My health is my biggest inspiration that keeps me going! I walk or run at least 1 mile a day and I am currently on a 110+ day streak!’, Suzanne stated. As an event organizer I encourage walkers, as Suzanne stated the event is a social opportunity to meet others while making it ones personal experience. I then asked Suzanne how often she worked out and if she kept a log, Suzanne replied ‘Currently I walk and/or run at least 1 mile every day. I do track my events and weekly workouts. I use my Apple Watch, which is my go-to tracker. I also use the app “RunKeeper” which is very useful as it calculates my weekly and monthly progress in miles, total distance, total elevation and total calories burned, etc. I love comparing month-to-month progress! 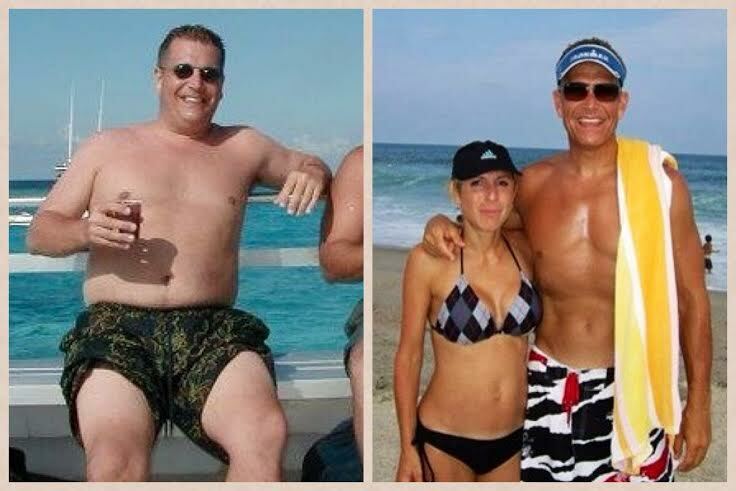 Wow that is inspirational, speaking of inspiration, Suzanne told me what keeps her inspired – her continued great health. Suzanne went on to say, ‘Also my loving family who is very supportive and has come to understand my “runner’s personality” – i.e. that I have to get my exercise on every single day, even if that means getting up to use a hotel treadmill at 4:30am on the morning before an out-of-town college visit (Hello Ithaca NY and Cornell University!!). The other people who keep me inspired are the many on Twitter and Instagram who share their progress every day. It’s a great community and we are extremely supportive to one another. I never thought I’d say that Social Media is a blessing, but it truly is in this case! Suzanne replied. I then asked Suzanne if she met someone new to running or walking what would she tell them, Suzanne stated ‘Start slow! I have made the mistake of trying to do too much too fast more than a couple of times. We runners and walkers are a bit stubborn in this regard… it’s really not worth injuring oneself. I had a person tell me once not to worry about pace but just enjoy the run. That was the best advice I have ever gotten on running and I have to remind myself of that every single day. Don’t worry about what others are achieving just enjoy yourself!! If you compare yourself to others I really believe you are setting yourself up for disappointment,’ Suzanne responded. our great Earth. My mind is all over the place! I find it fascinating and just let it happen organically. It’s really a Zen thing :),’ Suzanne stated. I certainly know what she is talking about as I come up with some pretty amazing inventions but the minute I get home I can’t recall a single one of them! 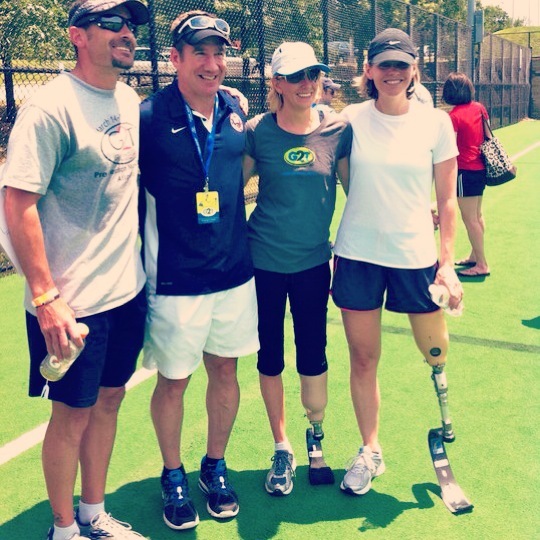 I went on to ask Suzanne if running has helped with her career, Suzanne stated ‘Absolutely! I am a pet sitter and accredited dog trainer. This career requires being in tip-top shape, as I work with animals of every size, shape, and strength every single day, keeping up with my running and walking keeps me physically fit, which helps tremendously in my career! 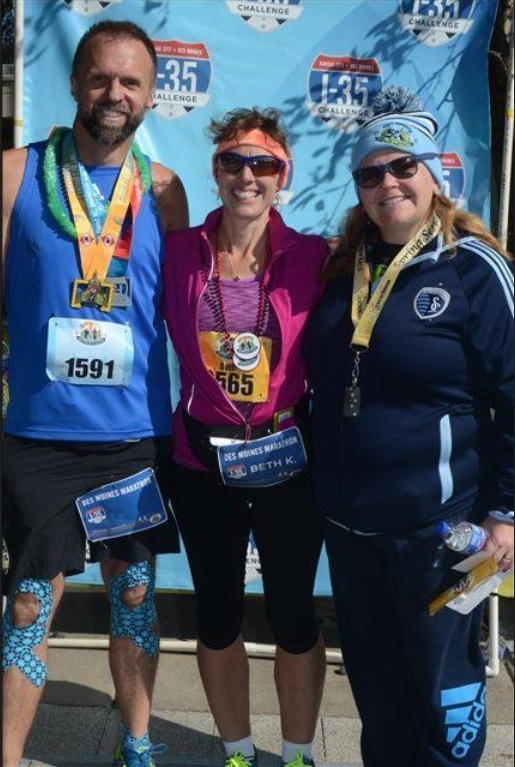 In my last blog interview we met a wonderful lady that took 20 years off from running and when she got back into it she set her sights on the Boston Marathon. My next interview is with a wonderful women that leveraged the feeling of running to ward of stress until she had a few health set backs then it became a different passion. 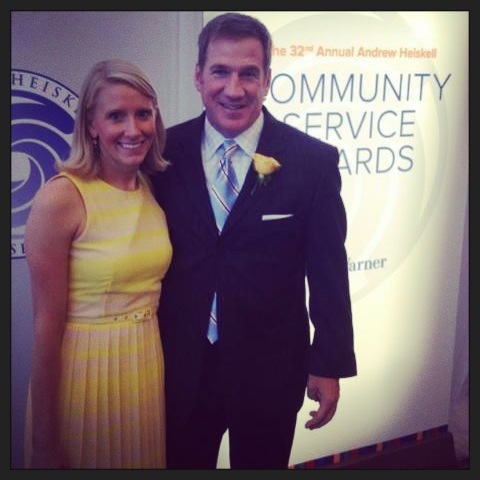 Anna started off by telling me about her inspiration with running, ‘I started running in college as a stress buster. On Saturday mornings I would go for a run before studying for the whole weekend. I have been running ever since. After moving to the UK I did a few 10ks and 5ks and in 2006-2007 I started doing triathlons. So I had to share my running with swimming and cycling. 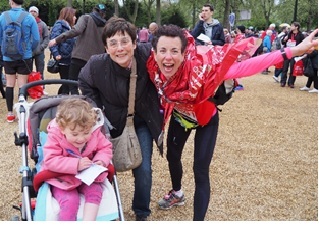 In 2011 I fell pregnant but I kept running at a lighter pace and shorter distances,’ Anna replied. ‘In 2012 I could not run much because I was pregnant and it was not very comfortable although I kept walking right up to my delivery date. I resumed running in late 2012. 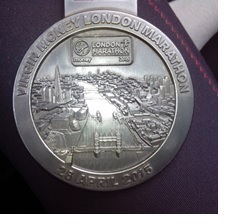 Carried on in 2013 but then it was tough as I was due to have heart surgery as a result of a leaky pulmonary valve. I had surgery in November of 2013. 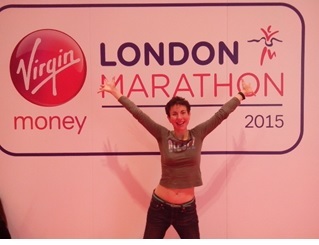 I resumed running in late February 2014 with the aim to complete my first marathon to prove to myself and the world that a heart sufferer can be fit, healthy and run,’ Anna stated emphatically. 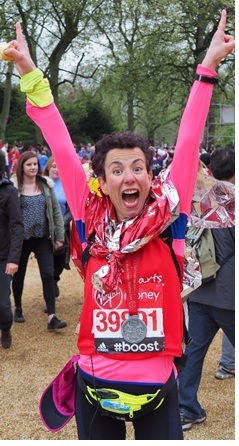 ‘I also wanted to raise money for heart charity, so in April of this year I did my 1st marathon, London, with a time of 5:30, the most wonderful thing I have ever accomplished and I have not stopped since. This year I managed to do two more half marathons and now I am training for the Manchester marathon in 2016,’ Anna replied. I went on to ask Anna about the frequency of her running and if she tracks it, Anna replied ‘I now try to run 4x a week, if not it is 3x a week, with a long run on Saturday at 27km. Tuesday is speed work with an 8k and on Wednesday I do a fast pace but not dead fast, Sunday is a recovery run for about 8-10km. I use garmin forerunner 220 to track my activity. It is a recent thing as it was given to me in august for my birthday. 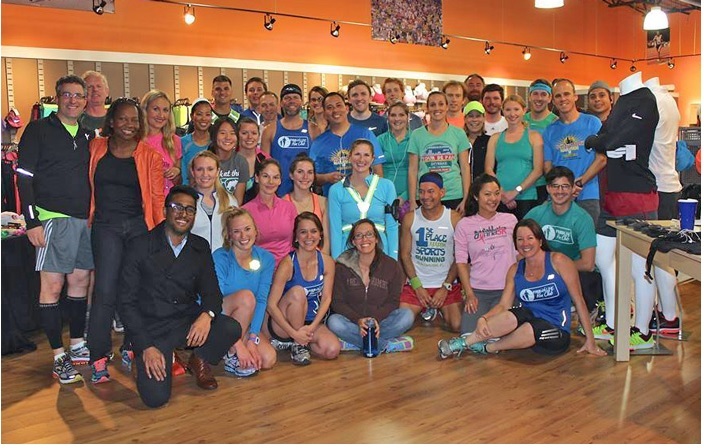 I use twitter as my support group as we all support each other in the running community! People who have done it tell you that it is a day to remember, unique, unforgettable, but beforehand you just cannot imagine it and understand it. I am now sitting down in my kitchen, with achy legs, and the only thing I can feel is the sense of achievement, pride, joy, my heart full of joy. I cannot hide that it is hard, a very hard test, physically and psychologically, but honestly it is worth it! No money can buy it. That was it, I ran a marathon, I am marathoner! As winter arrives the days get shorter! For some of us our routines go uninterrupted, for others we switch up our workouts, perhaps from morning to evening or in some parts of the country you might just take the season off as the weather is too cold. I am curious as to the longest one has taken off from exercising? We all do it as life has many chapters, from school to work to raising a family and its not always easy finding time for ourselves. My next story is about a wonderful lady I met online, by way of Twitter, as she stopped running for 20 years! Beth went on to tell me, ‘Next year I plan to run a full marathon, the Lincoln, as I just turned 45 and I have set my sights on Boston.’ I then asked Beth to share more about her inspiration/drive with running, Beth replied ‘The inspiration I get from running is the feeling it gives me as it rejuvenates me and I get to run with nature, meet new friends at events where I ended up with a ton of facebook followers and we all started running together. I also get inspired by others when I see them meet and exceed their goals’, Beth replied. I then asked if she met someone new to running or walking, what would she tell them, Beth said ‘Be consistant, no distance is too small.’ I then asked Beth what she typically thought about while running. ‘I’m hyper aware of things around me, looking at nature as it gives me energy and I am not afraid to get lost, which I tend to as my sense of direction isn’t the best,’ Beth responded. ‘I have a band of runners, no formal running group but a facebook group with friends where we meet up to run and grab coffee afterwards’. I went on to ask Beth if running has helped her with her career, Beth replied ‘I am a city clerk with the government and running has made me more confident. A final lesson that Beth wanted to share with others, ‘I’ve been on IB Moultrin for forty years and that is what gave me stomach issues that caused the ulcers – a lesson I share with others,’ Beth stated. Thank you for taking the time to chat with me Beth and good luck with the training and exceeding your goals for 2016. You have certainly given me insight into a couple more events that I might check-out. Stay Healthy! If the Shoe Fits – wear it! I always loved that saying: If the shoe fits wear it! Did you know the origin of the phrase dates back to the 16th Century? What I also found interesting is the expression is often used when something derogatory is said about a person who then complains to a third party. Well I guess phrases can mean many things depending on the moment. With my next guest the phrase truly means something positive, she not only runs, but she inspires others and educates them on the benefits! I then asked Shawanna about her favorite event(s), Shawanna stated ‘ I love the marathon. I can’t believe I just said that, because I used to think people who ran 26.2 miles were crazy. Guess what, I am crazy as well. I love the distance, because it’s a challenge to see how fast I can go for a long period of time. All that walking with my grandma and aunt is paying off.’ Shawanna went on to tell me about her running ‘I usually run 7 days a week but sometimes I take a day off when I am tired. I use running2win.com to track all runs and races. In 2014 I completed 22 road races which is a low number but I had to take it easy because I had hip surgery in the Spring of 2013′, Shawanna replied. ‘My goals for 2015 are to PR in a marathon, and run a sub 18 minutes for a 5k. I am still getting after it. I was really close in the Bunny Hop 5k(Columbia,SC) in April when I ran 18:06. 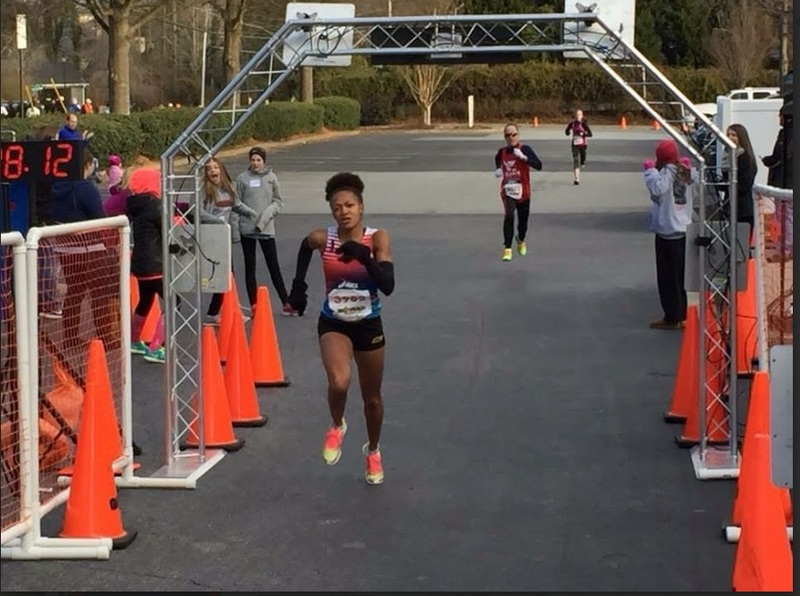 I am running City of Oaks in Raleigh on November 1st where I PR’d back in 2012 with a time of 2:52:38. 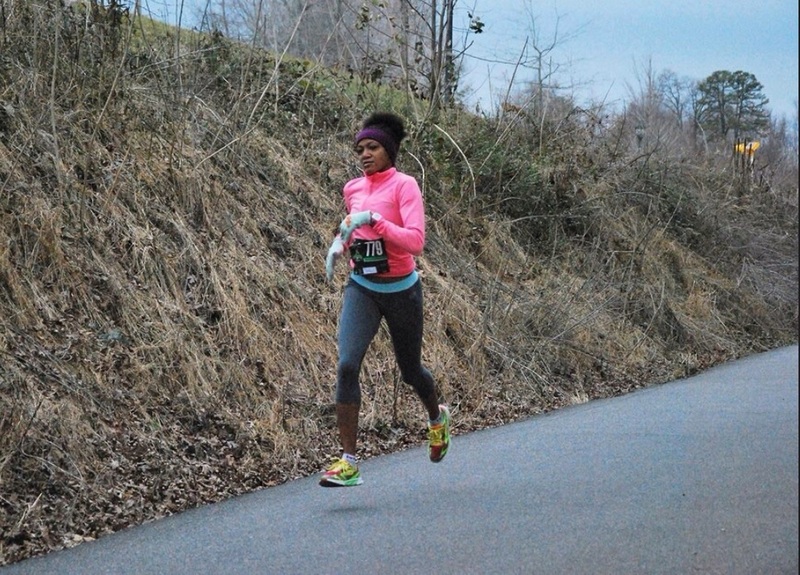 I went on to ask Shawanna what keeps her inspired ‘I am inspired by every runner (beginners, mid-pack, elite, masters). I love to hear about people accomplishing their goals, because it gets me excited about my goals. 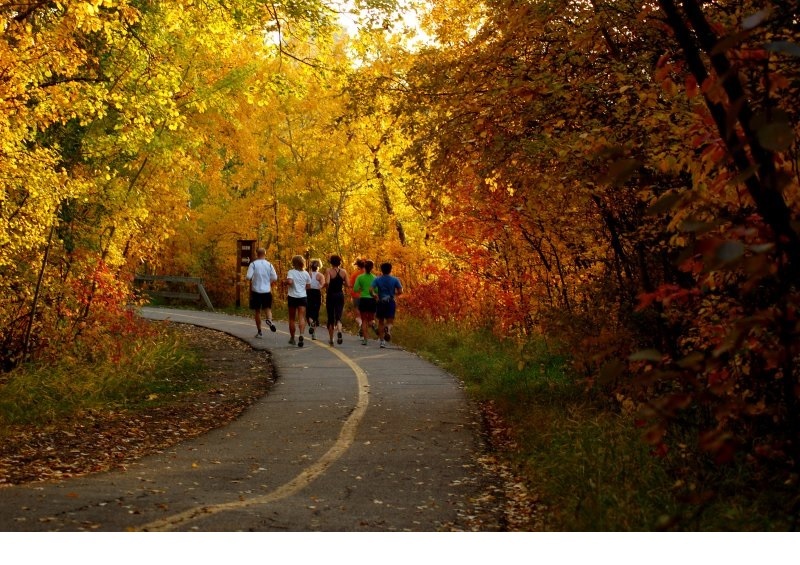 Chasing times, chasing distances or chasing people are all things that runners have in common. The beauty is that we all have a story that will inspire others so for me it’s all who share in this sport. Just too many to name,’ Shawanna replied. 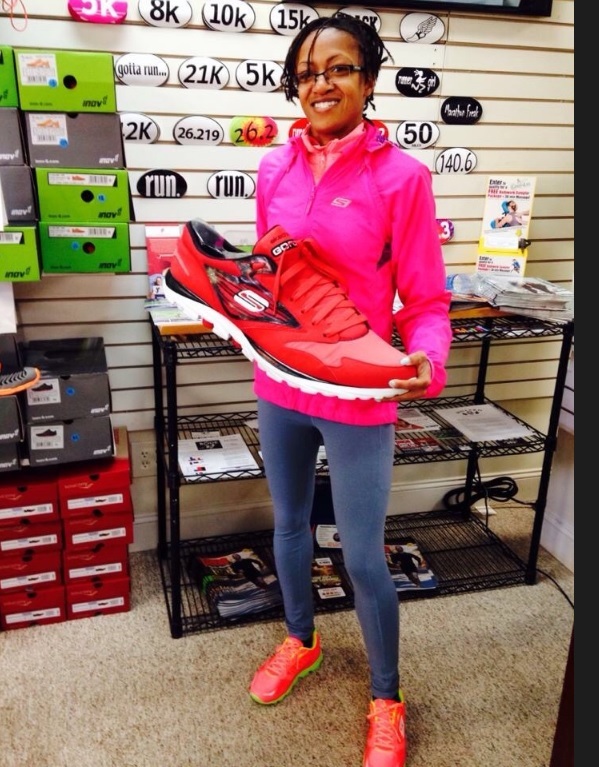 I then asked her if someone was new to running or walking – what would you tell them, Shawanna replied ‘I would tell them to get a good pair of shoes and start out slow’, remember if the shoe fits wear it :-)! Shawanna stated, ‘I am an ambassador for the Skechers Elite Team and I have a coach that does all the thinking for me about training. I don’t really have a nutrition plan that I follow. I just make sure to have a balanced diet with all the essential nutrients. 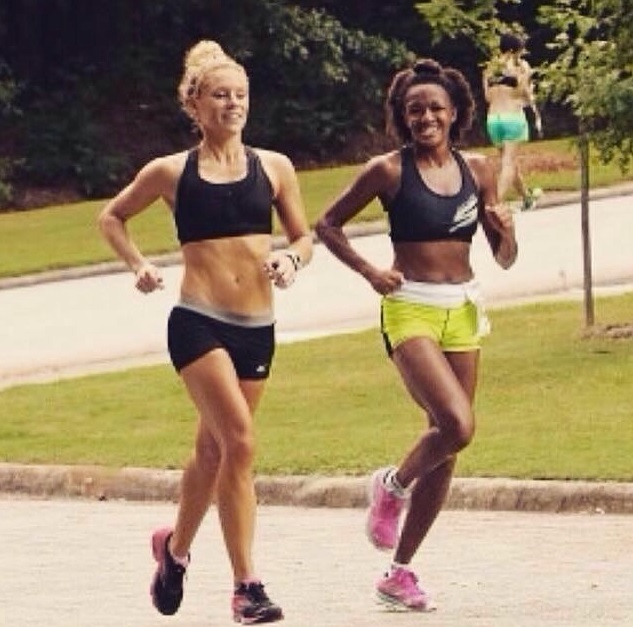 Be sure to follow Shawanna’s journey on Facebook @ peachrunner!! Thanks Shawanna and good luck completing your goals for 2015!!! Have you ever had breakthrough ‘innovative’ ideas while out on a run and thought to yourself – if only I had a brain ‘idea’ monitor to capture it – I just might remember it when I get back. For me completing running events or triathlons built confidence in my capabilities and it gave me the inspiration to set more goals and try harder – even though the day in and day out grind can be a challenge. So you could only imagine my excitement with my next blog as Mike Lenhart is another dear friend that seems to have amazing energy and passion for life! I asked Mike why he got involved in Endurance Sports. Mike stated ‘I was fortunate to graduate from West Point in 1990 and I incurred a 5-year military obligation as a result of the “free” education from the military academy. I was commissioned a 2nd lieutenant in the Army, serving in the Infantry branch. I was having such a great time in the military that I actually served a total of 7 years on Active Duty. My father is a retired Army colonel, so I found working in the Army to be a very comfortable, easy adjustment after graduating from college,’ Mike replied. ‘When I left the Army, many things changed in my life, most importantly the camaraderie I got from working around soldiers. I missed that and it wasn’t until I started becoming involved with endurance sports, namely “triathlons”, that I was able to find a similar connection that I had in the Army. Like many who start doing triathlons, I started with smaller distances, sprints and then olympic. Eventually, I moved up to Half IRONMAN events. Now, nearly 10 years since doing my first triathlon, I have nearly 100 races under my belt, including 4 IRONMAN events,’ Mike Replied. I went on to ask Mike what events he enjoyed the most, Mike said ‘The West Point Lake triathlon in Lagrange, GA has always been one of my favorites because it was my “first” triathlon and I became great friends with the race director, Jim Rainey. For several years after that initial race, I would go back annually and compete at West Point Lake as it was a great way to see how I was improving year-to-year,’ Mike replied. ‘Next, I love the Gulf Coast Triathlon (half iron distance) in Panama City Beach, FL. 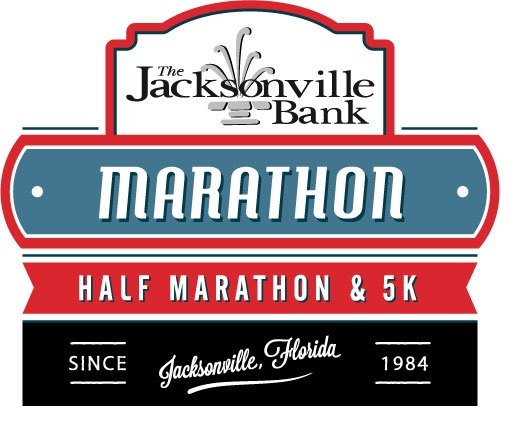 Besides the challenge of the longer distance course, this race is always held on a Saturday. So that meant I could take a trip to the beach, race on a Saturday, be done by lunchtime, and have the rest of the weekend to enjoy the sand and sun with friends,’ Mike stated. 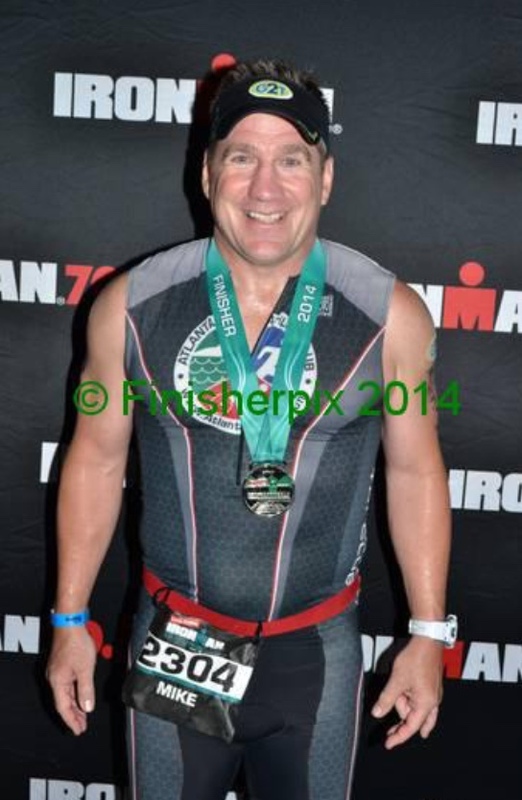 ‘Lastly, I raced the inaugural IRONMAN Chattanooga in 2014 and absolutely loved it. It certainly wasn’t my best performance at that distance but what made the race so special for me was the large number of “friends” who traveled from Atlanta to compete or cheer on participants. I raced as a member of the Atlanta Triathlon Club and it was inspiring to see nearly 100 teammates competing on the same course that day,’ Mike said. 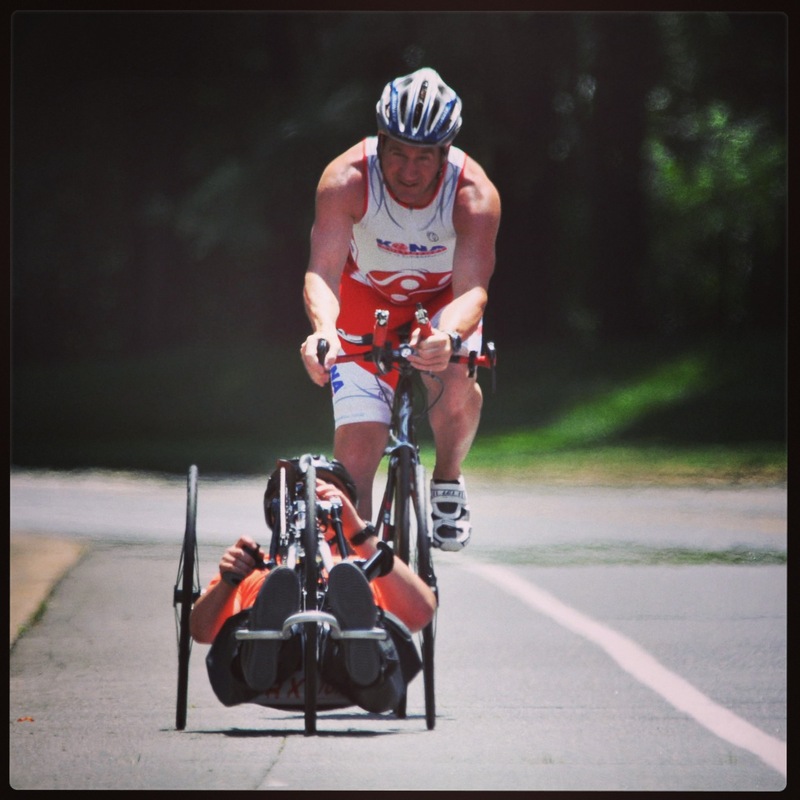 I went on to ask Mike about the Non-Profit he started and its inspiration, Mike said ‘In a nutshell, I started The Getting2Tri Foundation as a way to encourage participation in triathlons by individuals with physical disabilities. The organization puts on sport camps a few times a year to teach swimming, cycling, and running to individuals with limb loss, spinal cord injuries, paralysis, and other injuries that might otherwise limit their ability to stay healthy and active. Beyond the obvious benefits of teaching individuals to participate in sports, it’s the hidden gem of “confidence through sports” that I’ve witnessed time and time again by many of our camp participants. We might have someone on day 1 of a camp barely make it one length of the pool swimming. But by day 3 that same individual is doing multiple laps without stopping or requiring assistance. That’s the confidence I’m referring to that is further extended to the individual’s personal, family and professional life,’ Mike commented. 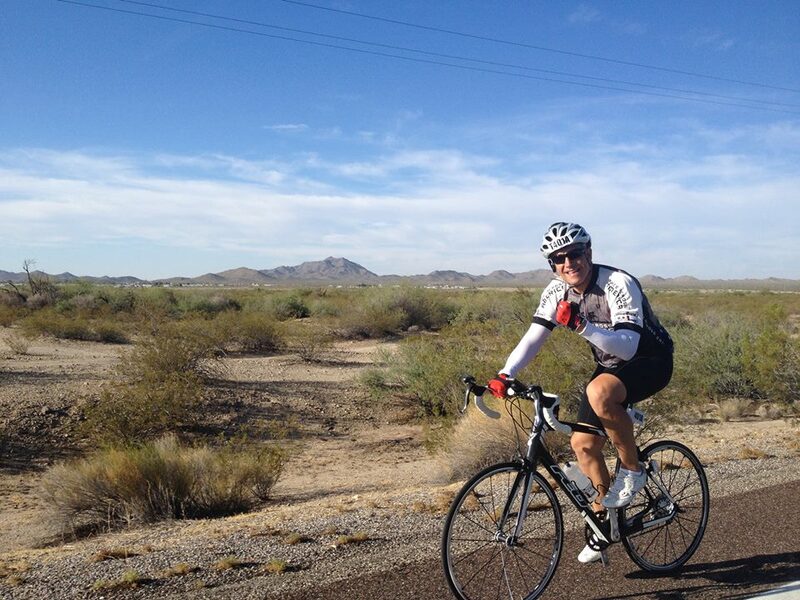 I asked Mike why he choose Triathlons, Mike said ‘For years, the sport of triathlon has been one of the best amateur sports where you can toe-up to the start line with all kinds of abilities and individuals next to you. 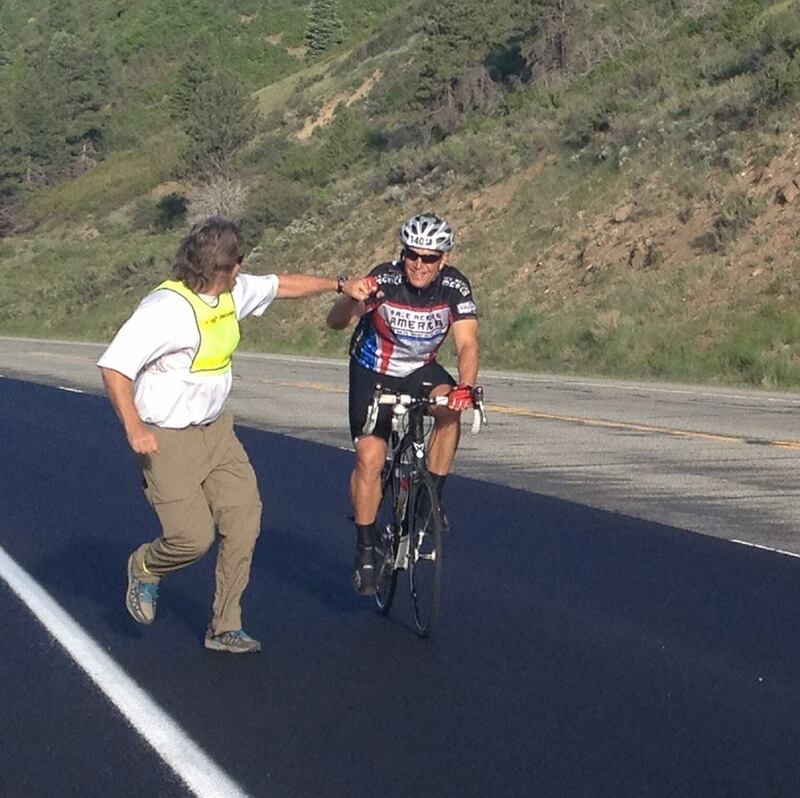 While on the course, you’ll see other age group athletes, novice “first timers”, paratriathletes, and elite racers. That sense of “invitation” was always appealing to me; competing in a sport where nearly anyone could likewise participate’. 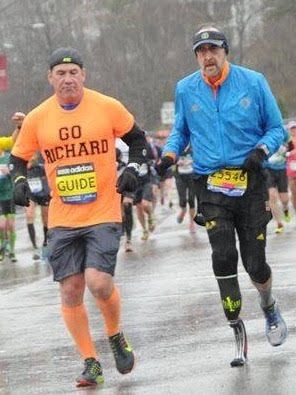 Such great advice Mike and I can’t agree with you more – as we continued our conversation I asked him if participating in endurance events has impacted his career, Mike said ‘Great question! I think participating in endurance sports requires some very long hours of training. If not managed properly, an athlete can let himself or herself fall behind in other important areas of life, such as family, work, etc. For me, I had to become even more organized than I already was. One tool was I would treat workouts as if they were regular meetings on my work calendar. I would schedule those on my calendar and, with some exception, I wouldn’t break those “meetings” just as I wouldn’t break normal “work” meetings. So I’d say becoming better organized was a great by-product of my participation in endurance events’. I couldn’t agree more as its a balancing act and if you are passionate enough about something you find ways to make it happen even during challenging days which happen often. Thanks Mike and good luck in Charlotte..
During the past 10 years as I participated in various running events and triathlons, I got to meet a lot of inspirational people and I am honored to share this story of a dear friend I met by way of the Triathlon Community. I have to admit I didn’t know much about him outside of brief conversations on what event we were participating in next or what organization needed help setting up events, but I can now say learning more about him taught me a great lesson on persistence. ‘I was also wearing a size 42 but the day finally came where I couldn’t get them on, so I bought a size 44, it was at that moment I said to myself – no more, that is it! I needed to start losing weight! I told myself I was only going to buy one pair. My highest weight was 268lbs. So I decided to target one healthy thing at a time. I was drinking about 10-12 cokes a day, so I started to cut-back.’ Beau replied. ‘The next thing I was going to cut back on was my 2-3 days per week drive thru trips to McDonald’s for breakfast. So I replaced coke with water, McDonald’s with banana and oatmeal or similar healthy choices. It took me 3-4 months to conquer each phase and it took me 4 years to go from 268lbs to under 200lbs, just by eating better. It was creating a new lifestyle – which took a lot of discipline.’ Beau stated. 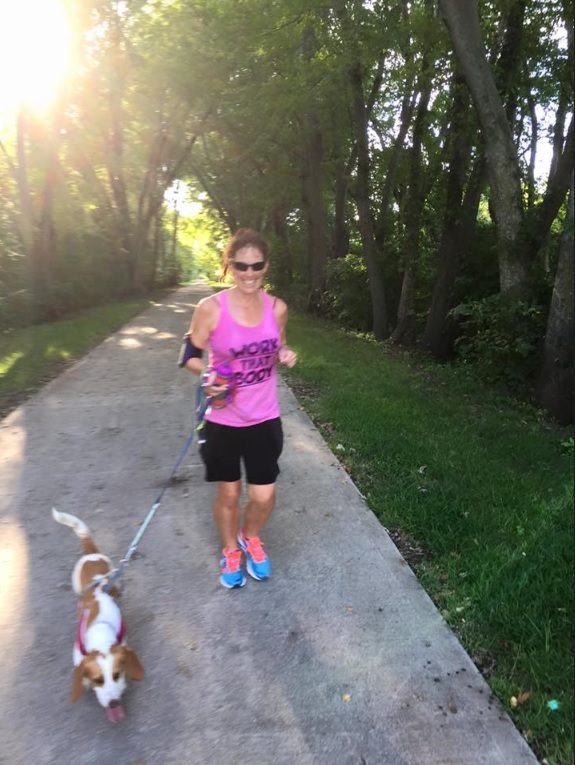 Beau went on to tell me, ‘When I was at 220lbs I decided to do my first 5k, so I went out for a 1 mile run and I couldn’t even complete a half mile – I wasn’t upset as I always tried to stay positive and realistic about these milestones and my health. So every day I would go out on that very same route and eventually I could start to go further and within 4 months I could finally complete a 5k. 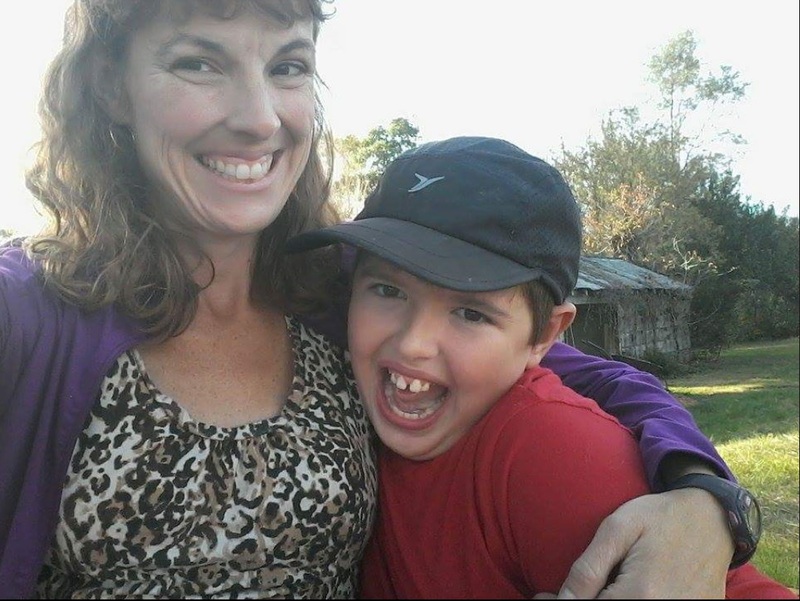 So I signed up for my first 5k and I was ‘soo’ emotional when I completed it – it was a big deal for me.’ Beau said. 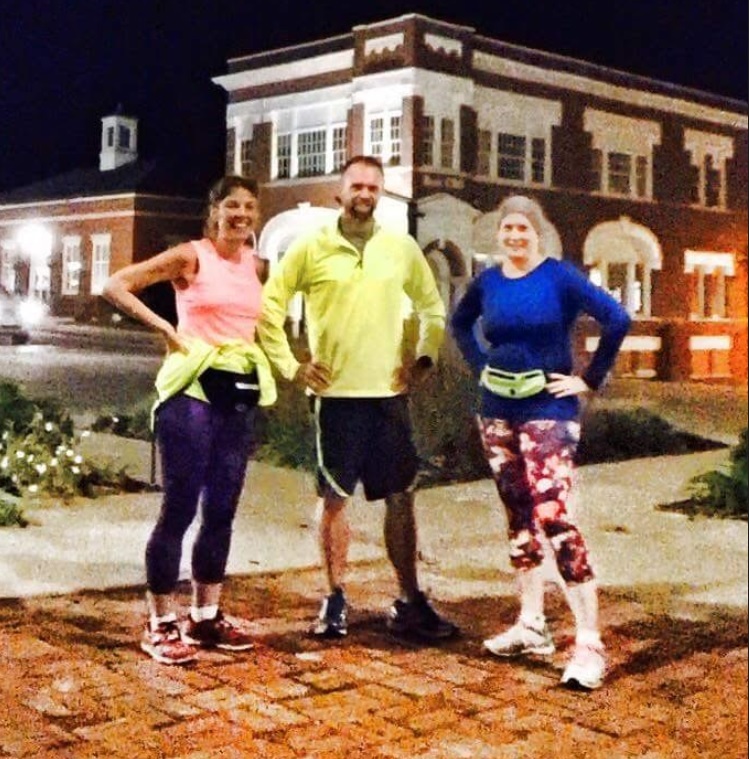 ‘I learned that running also needed to become a lifestyle so I signed up for another 5k. I was targeting at least one 5K per month in my first year and I actually exceeded it. I then graduated to doing 10ks and I eventually got comfortable with that and advanced to Half-Marathons and then Marathons where I found myself doing 6-7 marathons a year,’ Beau stated. ‘I then got into Triathlons and took the same route starting with sprints and then slowly moving up to a full Iron-Man where I have completed twelve. I also recently completed Race Across America with a team and I entered a 41 mile swim – yet I didn’t finish it,’ Beau replied. ‘ I have learned that not finishing a race for me isn’t a big deal. I would rather go out and push my limits and not finish a race vs. take on a race I know I can accomplish as it pushes me to test my limits and really challenge myself. 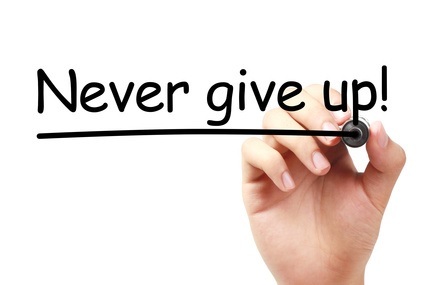 If I go out and DNF but give it my all I am truly happier than doing a race that I finish and it not challenging me. I have a number of DNF’s on my resume but it’s what allowed me to ultimately get to the next level,’ Beau responded. I went on to ask Beau about his favorite events, Beau said ‘Race Across America was the best, everything that goes into it from the crew to being able to see the US by bike, it’s like nothing ever experienced. The next favorite Event(s) are all the Iron-Man races and of course my first 5k that I completed in Brookhaven, ‘ Beau said. Beau told me that getting to the start line of that first 5K was one of the most difficult things he’s ever done simply because of the lifestyle changes he had to make and the weight he had to lose just to do it. Then Beau went from participating in events to putting them on and I asked him about that. So I asked Beau what advice he would give someone new to the sport, Beau replied ‘Not to worry about how to do it – don’t wait, get started now– don’t worry about the right shoes, it won’t hurt to run a couple miles, just get out and get started as everything will fall into place,’ Beau responded. Thank you Beau as this story touched me in many ways and is a great example of the lifestyle changes we all need to make at various points in our life and that it’s never too late to get started. See you out on the trail or road!